On Saturday Oct. 14, the Indian Cultural Association put together the celebration of Diwali in the Vaughn Courtyard. Members of the association welcomed all students to come together and enjoy traditional performances, music, and Indian cuisine. Diwali is the annual, five-day Hindu festival of lights that signifies the triumph of light over darkness or good over evil and is celebrated by millions of people around the world. This year, the official date of Diwali is Oct. 19. Diwali is celebrated to commemorate the great victory of the Hindu god Rama had after been exiled from his kingdom of Ayodhya. Fourteen years after being exiled, Lord Rama came back to the kingdom and successfully conquered the demon king, Ravana. After his defeat, his people decorated the streets of the kingdom with rows of lamps, symbolizing the defeat of evil against good. “To me, Diwali means a time of bringing people together just as any major holiday does. Families, friends, colleagues come together to share sweets typically which is a sign of expressing love and affection towards those who are close to you.” says Senior Associate of the ICA, Jaini Chhaya. The word “Diwali” translates to “series of lights” and is primarily marked by the presence of different forms of light including candles, lanterns, and fireworks. The courtyard was lit with LED candles lined across the whole perimeter. 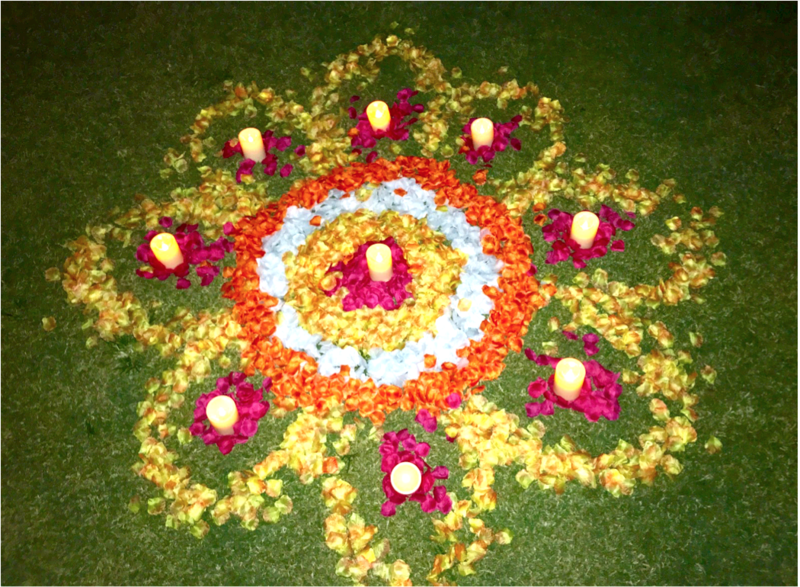 A beautiful Rangoli display of flower petals and candles in the shape of a flower were arranged in the grass by Ishita Jariwala. Throughout the event, music was being played for guests to dance to by student DJ Ijaaz Hirani, playing a combination of traditional Indian music with modern twists. Food was catered by Saffron Indian Cuisine, and guests were served traditional dishes such as naan, butter chicken, vegetable curry, paneer tikka masala, and gulab jamun. Three performers showcased their talents for the audience. First, Varsha Vaddiraj played the classical Indian instrument of the Sitar. Then, Kamakshi Dadhwal danced to a mashup of popular Indian songs. The performances ended with a trio dance group consisting of Maya Patel, Krishah Shah, and Kushna Shah. Many students were attired in brightly-colored garments such as sarees and kurtas. Also present was a Henna booth with two tattoo artists giving students intricate designs on their hands.